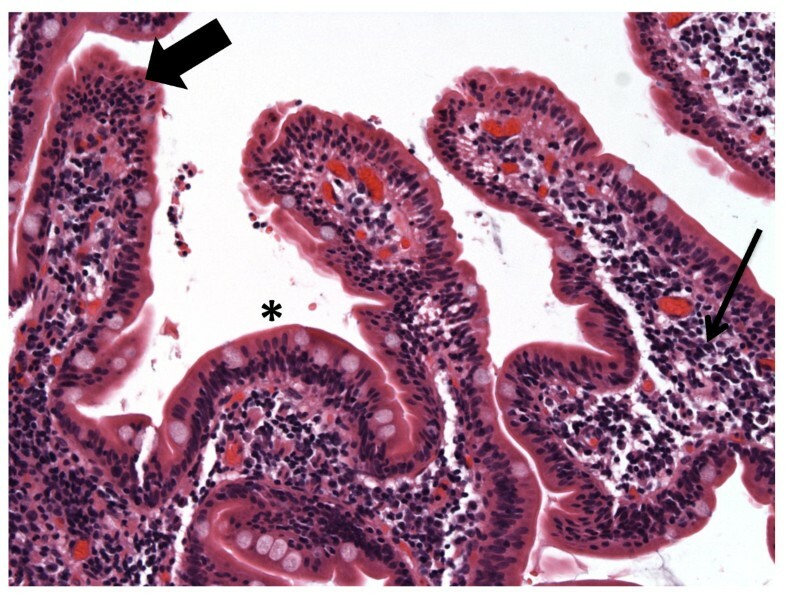 Immune enteropathies are heterogeneous group of rare conditions characterized by intractable diarrhea, damage to intestinal epithelia and constituent cells, and villous atrophy. These enteropathies may be associated with primary immune deficiencies (PIDs) such as the immune dysregulation, polyendocrinopathy, enteropathy, X-linked (IPEX) syndrome, common variable immune deficiency and selective IgA deficiency, or may occur in patients with auto-immune phenomena in the absence of PIDs where it is termed auto-immune enteropathy (AIE) . Typically, the diagnosis of immune mediated enteropathy in the setting of PIDs is clear from the clinical features and a pre-existing diagnosis of PID. In contrast, AIE may be diagnosed in patients with no evidence of PIDs, intractable diarrhea refractory to exclusion diets, and no evidence of celiac disease . Cumulatively, immune enteropathies, including AIE, have an unclear pathogenesis. They are all thought to be mediated by immune phenomena, either through direct damage to gut epithelial cells by auto-reactive cells (IPEX) or auto-antibodies (AIE), or from a propensity for bowel infections (IgA deficiency). However, the exact cell types causing damage and the mechanisms of disease remain unclear in many of these conditions. Herein, we report a patient with an immune mediated enteropathy distinguished from previously reported cases by an unusual CD8+ CD7- IEL in the absence of a PID. 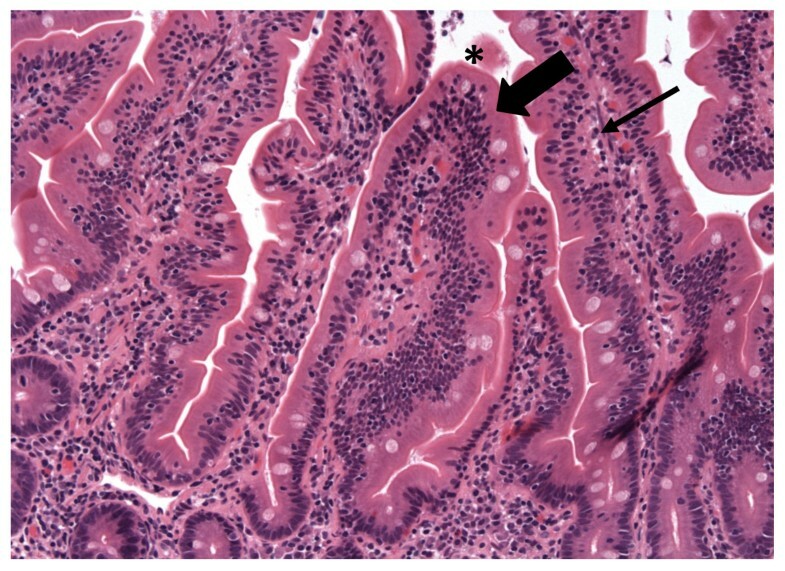 We also review the literature to characterize the histologic and immunophenotyic features of AIE, which our patient's enteropathy most closely resembles. The patient was a 28 year old Asian Indian female of non-consanguineous parents who presented with a 3 year history of non-bloody diarrhea with abdominal cramping. Past medical history was significant for hepatitis A. She denied alcohol or tobacco use, had no chronic medical conditions, was not on any medications including gut irritants such as aspirin/non-steroidials and did not have a history of travel prior to onset of symptoms. Her last travel was to India one year prior to presentation, but she did not report any alleviation or exacerbation of her symptos with the travel/dietary/environmental change. She weighed 81 pounds at presentation. Stool cultures were negative for pathogens. Basic labs, including the erythrocyte sedimentation rate and C-reactive protein were normal, but liver function tests (LFTs) were elevated (Table 1). Abdominal computed tomography (CT) revealed hepatic hypodensities and mesenteric adenopathy. Serology was negative for anti-nuclear (ANA) and anti-smooth muscle antibodies as well as antibodies for cytosolic anti-neutrophil cytoplasm (cANCA), liver-kidney microsomes, liver cytosolic and soluble liver-pancreas antigen. However, pANCA was positive (titer: > 1:20) and she had hyper-gammaglobulinemia (IgG: 2358 (630-1580 mg/dl), IgA: 578 (100-400 mg/dl), IgM: 134 (37-247 mg/dl). Serum ceruloplasmin was normal, and serology for hepatitis B and C were negative. Serum B12, folate and hematocrit were normal. 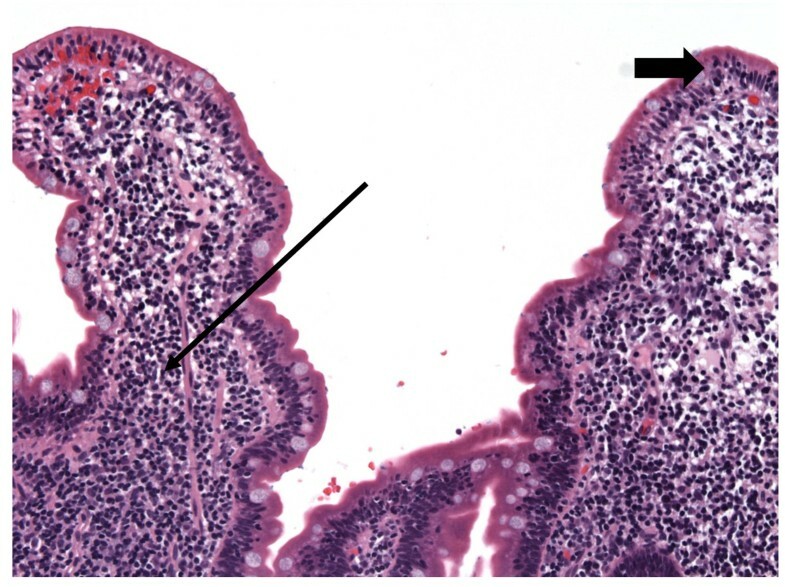 Histologic examination of intestinal mucosa demonstrated chronic inflammation with duodenal intraepithelial cell lymphocytosis (IEL) (Table 1) (Figure 1). Celiac disease and tropical sprue were therefore considered based on the clinical features and IEL. However, tissue transglutaminase (TTG) IgA was normal (5.3, reference: < 7.0 AU), as were anti-enterocyte antibodies (only IgA tested) (both measured by enzyme linked immuno-absorbant assay of serum). Indirect immunofluorescence on human intestinal tissue samples was not performed. The patient refused liver biopsy, but permitted CT guided biopsies of the enlarged retroperitoneal and periportal nodes; histologic analysis only demonstrated normal stroma. She was diagnosed with auto-immune hepatitis (AIH) based on her revised original International AIH group score of 12 (indicating probable AIH by criteria). Duodenal biopsy at presentation demonstrating regions of IEL (large arrow) with normal appearing LP (small arrow) and interspersed areas of villous blunting (*). Over the next 21 months, she continued to have diarrhea despite dietary exclusion therapy, and elevated LFTs (Table 1). Because serum folate and B12 remained withing normal limits for the duration of her care, she was not treated with these agents. She did develop a mild iron deficiency anemia, but never required blood transfusions. Endoscopy 15 months after presentation demonstrated progression with grossly friable duodenal mucosa. There was marked IEL with a CD8+ T-cell subset without evidence of enteropathy type T-cell lymphoma (Figure 2). Flow cytometry revealed a nearly 100% T-cell preponderance, the majority of which were a polyclonal αβ T-cell receptor (TCR)+ CD8+ CD7- subset (Table 1: 15 months). Clonality was assessed by polymerase chain reaction of TCR chains. The minority of IELs were CD4+ and CD8+ CD7+ subsets; there were normal numbers of intra-epithelial γδ T-cells and rare B-cells (CD20+). Biopsies samples from the stomach and esophagus were normal, as was colonoscopy. There was no evidence of reduced numbers or abnormal morphology of epithelial or goblet cells. Duodenal biopsy before steroid therapy demonstrating regions with persistent IEL (large arrow) with marked LP lymphocytosis (small arrow). Because of the marked IEL without laboratory or histologic evidence of celiac disease, she was treated with Ciprofloxicin® and Metronidazole® for potential bowel overgrowth and/or tropical sprue. However, six months of antibiotic therapy did not result in clinical or histologic improvement (Table 1: 21 months). Although refractory celiac disease is possible in this scenario, but the lack of elevated intra-epithelial γδ T-cells, normal TTG IgA, and her negative HLA-DQ2/DQ9 genotype make this unlikely. A diagnosis of an immune mediated enteropathy was therefore considered based on the lack of clinical or histologic response to dietary and antibiotic therapy, and the lack of celiac disease serologic markers. Prednisone (60 mg) daily was started. Steroid therapy resulted in marked improvement with symptom resolution accompanied by a 20 lb weight gain. She remained in clinical remission 4 weeks after therapy when repeat Endoscopy demonstrated persistent IEL, but a reduction in the CD8+CD7- fraction to 41% of total CD3+ cells (Table 1: 24 months). Histologically, regions with normal villi were now interspersed with abnormal regions (Figures 3 and 4). Her LFTs remained elevated despite the clinical remission and histologic improvement. The patient decided against maintenance therapy with prednisone or azathioprine because she wanted to get pregnant. Duodenal biopsy 4 weeks after completing steroid therapy obtained during symptom resolution demonstrating normal tissue (IEL and LP compartments marked by large and small arrows, respectively). Duodenal biopsy obtained at the same time as in figure 3, but from a different region demonstrating abnormal tissue with blunted architecture (IEL and LP compartments marked by large and small arrows, respectively). At least 29 cases of AIE have been reported, of which, 26 meet the original diagnostic criteria for AIE [3–9] (Table 2). Eighty five percent (22/26) had anti-epithelial cell antibodies (anti-enterocyte (AEA): n = 17 (65%), anti-goblet cell (AGC): n = 7 (27%), or both: n = 2 (8%)), which were of the IgG class in 76% (13/17) with AEA and 100% (7/7) with AGC. The remaining four patients without antibodies had at least one autoimmune condition (Table 2). Hypothyroidism was most frequently reported, but no disorder was strongly associated with AIE. The majority (69%) had other circulating tissue auto-antibodies, most commonly, ANA (Table 2). Fourteen studies detailed the sites of disease, and 9 provided some immuno-phenotypic analysis (Table 3). The small bowel was the most frequently involved (79% of cases), followed by the colon and stomach. Six (43%) patients had multiple sites and two had extensive disease (stomach, small intestinal and colonic disease) ('generalized autoimmune gut disorder')[5, 10, 11]. Nine patients (75%) had small bowel IEL at presentation while at least one case reported concurrent colonic IEL. Complete or partial clinical response with therapy was associated with improved IEL in all 8 cases that reported these findings [5–9, 11, 12]. The IEL was predominantly T-cells (CD3+) in at least three cases, and was furthermore CD8+ in at least one of these. T-cell (CD3+) lymphocytosis was also reported in the lamina propria in four of five cases that provided this data (Table 3). One case demonstrated extensive abnormalities in CD4+ T-cells, including increased tumor necrosis factor (TNF)α production from activated rectal lymphocytes . However, this finding must be cautiously extrapolated because that patient had active CMV colitis and it is therefore possible that the TNFα response represent epiphenomena. 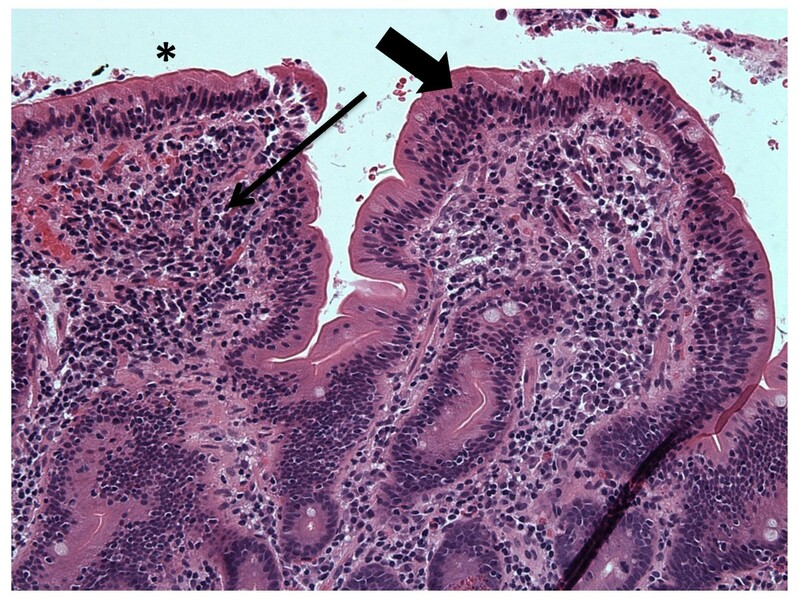 We report a patient with an enteropathy associated with an aberrant CD8+CD7- T-cell IEL. Clinically, on histology and by flow cytometry, our patient had characteristic features of an immune mediated enteropathy. The abberant T-cell subset in our patient was reproducible, polyclonal, and correlated with the presence of clinical symptoms. Moreover, the symptom resolution and weight gain with steroid therapy correlated with improvement in villous architecture and a decrease in the CD8+CD7- T-cell subset. These facts strongly argue that the T-cell subset was at least partially involved in our patient's enteropathy and was potentially causative, especially considering the failure of dietary exclusion, antibiotics and other therapies in inducing clinical, histologic or immunologic improvement. The salient feature of our case therefore remains the aberrant CD8+CD7- IEL in the absence of abnormalities in CD4+ or NK cells as have been previously reported in AIE [5, 13]. CD7 is a member of the immuno-globulin superfamily and is expressed on most thymocytes and early in the ontogeny of T- and NK-cells where it is thought to participate in intracellular signaling . The majority of peripheral T-cells in adults bear CD7, but CD7- T-cells are a normally circulating minority comprising 9% of all peripheral blood monocytes (PMBC). The majority of CD7- T-cells are CD4+ (8% of PMBC) with CD8+CD7- cells accounting for the remaining 1% of PMBC (CD4+/CD8+ ratio = 8). Although the exact function of CD7- T-cells is uncertain, they appear to be terminally differentiated, activated T-cells. Stimulated CD4+CD7- T-cells produce high levels of interleukin-2 and gamma interferon, and compared with CD7+ subsets, have augmented proliferative responses to protein antigens . Furthermore, CD7- T-cells express higher levels of activation markers including CD45RO and CD25 compared with their CD7+ counterparts . CD7- T-cells may also play a role in autoimmune disease evidenced by the increased CD4+CD7- cell expansion and accumulation reported in rheumatoid arthritis  and psoriasis . These data suggest that the CD8+CD7- subset demonstrable in our patient were activated cells that were potentially causative. The diagnosis of AIE requires the presence of auto-immune phenomena, typically taken to be circulating auto-antibodies to intestinal epithelial cells and/or the presence of auto-immune disease(s) in the absence of celiac disease or PIDs. Our patient had no evidence of anti-epithelial cell antibodies, and in the absence of her diagnosis of AIH, had no other auto-immune conditions. Moreover, her diagnosis of AIH, although based on accepted guidelines, is suspect as she had "auto-antibody negative" AIH, a low pANCA titer, and no liver biopsy . Notably the classical AIE criteria remain controversial, with alternative suggestions to limit the AIE to only those with demonstrable anti-gut epithelial cell antibodies or refine the diagnosis based on histologic immuno-phenotypic characteristics . Regardless of whether our patient meet criteria for AIE, the cumulative evidence suggest our patient had an immune mediated enteropathy. This conclusion is further bolstered by the reduced fraction of CD8+CD7- cells concurrent with clinical improvement on prednisone therapy. Our review finds that AIE is most often characterized by (a) IgG subclass anti-epithelial cell antibodies, (b) preferential small bowel Involvement, and (c) CD3+ αβ TCR+ intra-epithelial and lamina propria lympocytosis. A protean set of histologic abnormalities have been reported, including: villous atrophy, absence of goblet and paneth cells [3, 4, 18], IEL and infiltrates into the lamina propria (LP). The clinical features and therapeutic response of those with AIE but without anti-epithelial cell antibodies [4, 10, 19, 20] appears indistinguishable to those with antibodies. While the data suggest AIE is associated with a CD3+ T-cell intra-epithelial and lamina propria lymphocytosis, it must be judiciously interpreted due to the paucity of cases that reported immuno-phenotypic findings, and because CD3+ cells are the dominant subtypes in these compartments. CD4+ T cells are thought to be at least partially responsible for AIE based on (a) the phenotypic similarities between AIE and the IPEX syndrome [21, 22], (b) the role of CD4+ T cells in villous atrophy  and (c) the aberrant CD4+ T cell subsets and CD4+ IEL reported in some cases of AIE . Despite these points, our review suggests that, at present, there is insufficient evidence to definitively confirm or refute this hypothesis in adult onset AIE. It also remains possible that AIE is the common phenotypic result of a heterogeneous set of mechanistic abnormalities rather than a single unified condition. Our patient likely had an auto-immune enteropathy associated with an aberrant CD8+CD7- T-cell IEL. Our review of adult onset AIE suggest that the most common features are the presence of IgG type anti-gut epithelial antibodies and preferential small bowel involvement. Written informed consent was obtained and the study was approved by the institutional review board of the University of Kentucky Medical Center.